Prince Bernard of Saxe Weimar, commander of the 2nd Brigade of the 2nd Netherlands Division. This brigade was almost entirely composed of Nassau troops. 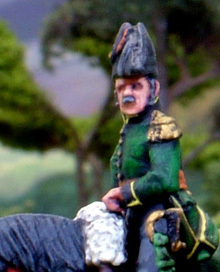 The model used for his aide is a French Aide de Camp. The vignette was painted by Peter McCarroll who liked the Green which matches the Nassau unifroms but supsected the Prince may have worn blue. King James, St Ruhe and Staff AVAILABLE TO PREORDER!